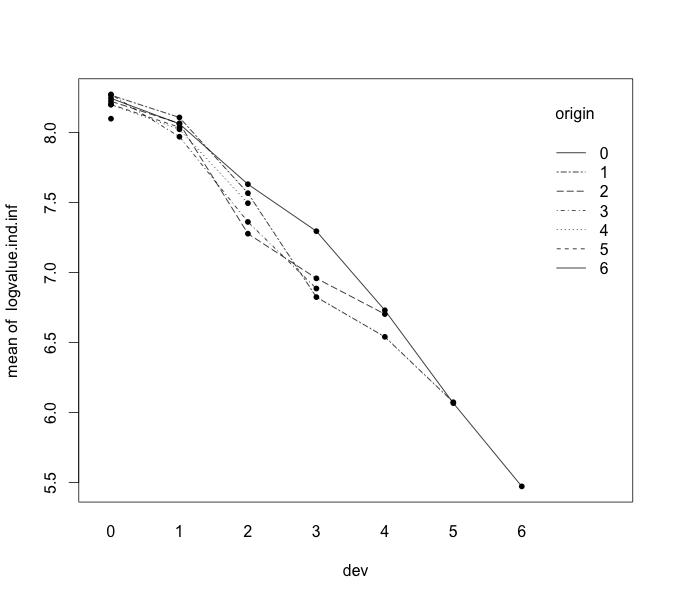 This is the third post about Christofides' paper on Regression models based on log-incremental payments . The first post covered the fundamentals of Christofides' reserving model in sections A – F, the second focused on a more realistic example and model reduction of sections G – K. Today's post will wrap up the paper with sections L – M and discuss data normalisation and claims inflation. I will use the same triangle of incremental claims data as introduced in my previous post. The final model had three parameters for origin periods and two parameters for development periods. It is possible to reduce the model further as Christofides illustrates in section L onwards by using an inflation index to bring all claims payments to current value and a claims volume adjustment or weight for each origin period to normalise the triangle. In his example Christofides uses claims volume adjustments for the origin years and an earning or inflation index for the different payment calendar years. The claims volume adjustments aims to normalise the triangle for similar exposures across origin periods, while the earnings index, which measures largely wages and other forms of compensations, is used as a first proxy for claims inflation. Note that the earnings index shows significant year on year changes from 5% to 9%. Barnett and Zehnwirth  would probably recommend to add further parameters for the calendar year effects to the model.